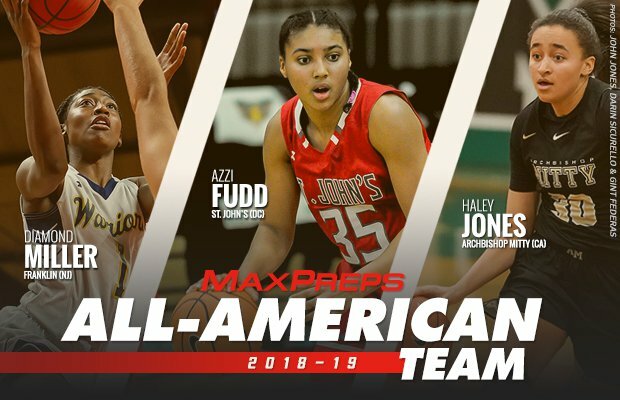 Understand, please, that this is a 2018-19 high school All-American team. It is not a list of the best college prospects; summer performance is not factored in; it is not a career award that takes into account an entire high school and club career. The following 50 players have been selected after consultation with sources around the country as the ones who played well individually this high school season and helped their teams become the best they could. That said, are there players who could have been mentioned but weren't? Of course, but we are confident — after doing our due diligence — that the 50 players on our list are outstanding high school players who had very good, if not flat-out great, 2018-19 seasons. See the St. John's sophomore in action. Bueckers is tall, skilled guard who led her team to a perfect record and a state championship by posting mind-boggling stats: 24.4 points per game, 4.7 rpg, 5.5 apg and 4.7 spg, plus a 3:1 assist/turnover ratio, 58 percent shooting from the field and 83 percent from the line. The Player of the Year for the nation's No. 2 team averaged 26.3 ppg, 6.2 rpg, 2.5 apg (despite not running the point) and 1.9 bpg. Oh, one of her besties is Paige Bueckers, so she too might wind up at UConn. Africentric was loaded with top-shelf talent, so Horston's numbers — 18.1 ppg, 7.1 rpg, 6.0 apg, 3.8 spg — reflected the need to share the ball. But even though Horston's numbers might not seem as impressive as some others, there's no doubt she belongs on the first team. Even in the era of positionless basketball, Jones' versatility is impressive. She can bring the ball up or guard a post in the paint. And her stats aren't bad either: 26.1 ppg, 12.1 rpg, 4.4 apg, 3.7 spg, 2.8 bpg. New Jersey, as is usually the case, is packed with good teams and good players, and Miller led Franklin to an unbeaten season and state title, scoring 22.1 points and grabbing 8.2 rebounds a game along the way. She's much more than a dunker, even though she's still learning the game. 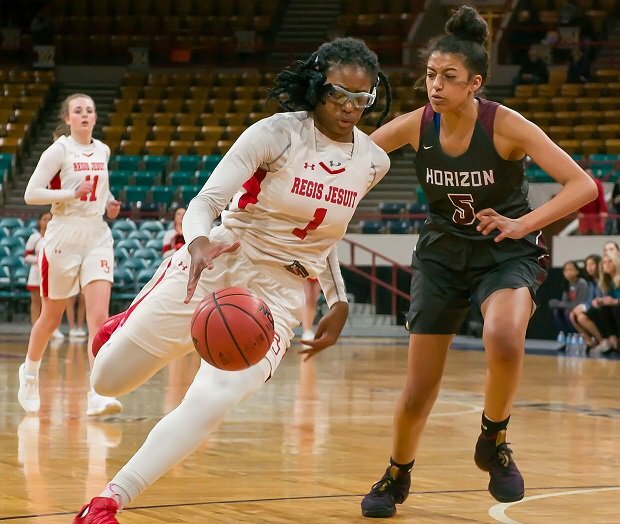 Regis Jesuit played tough teams all over the country, and in Colorado, and Belibi's statistics (21.8 ppg, 12.3 rpg, 3.4 spg, 2.7 bpg) were earned. Ohio was loaded this year, and Bell was named Player of the Year in the state for the third time. She averaged 28.8 points to go along with 8.0 rebounds and 4.0 blocks a game. Boston never played in a major high school event, but Worcester Academy went 24-1 and won the New England Preparatory School Athletic Council 2A title behind her 17.3 ppg, 10.6 rpg and 3.2 bpg. Brink is very skilled for a 6-foot-4 post as she can handle the ball in the open court and knock down mid-range jumpers. Her numbers — 20.8 ppg and 10.8 rpg — undersell her potential. Jackson was the Michigan Player of the Year for the third straight time, and Edison won the Class 2 championship (after getting bumped up a division). On a very talented team, Jackson scored 22.0 points a game. Though Clark and her Dowling teammates didn't face any out-of-state competition, the numbers are still extremely impressive: Try 32.6 points, 11.8 rebounds, 3.6 assists and 2.3 steals each game. That's a month for a lot of players. Griffin led her team to the final game in the New York Federation playoffs, and along the way, put up 28.2 ppg, 10.4 rpg, 4.3 apg, 3.5 spg and 2.0 bpg. 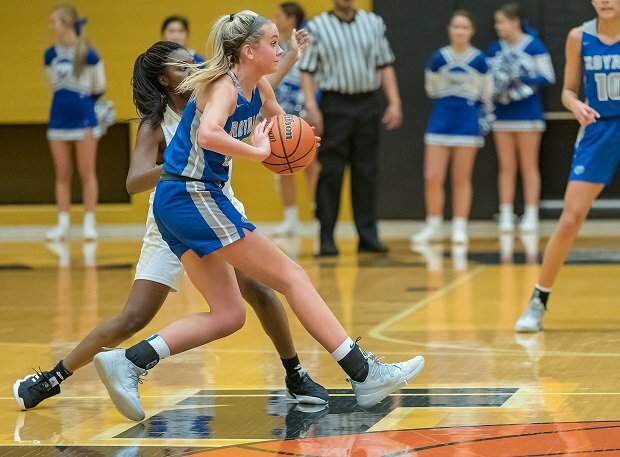 Parrish led Hamilton Southeastern to a 27-1 record, an Indiana title and the 16th spot in the Top 25, in part due to her contributions of 21.0 points, 6.9 rebounds and 2.5 assists each game. Reese had to a lot of heavy lifting for No. 17 St. Frances, and though 19.6 ppg is impressive, her defense and 18 rebounds a game might have been more so. On a very talented and very balanced roster for No. 1 New Hope, the 5-6 sophomore still stood out, averaging 23.0 points, 5.0 assists and 4.0 steals for the season. Beal's statistics are more than solid — 24.8 ppg, 14.0 rpg and 4.5 apg, and so is the 28-2 record for Rock Island. Frank was the key cog in Strafford's 115-game winning streak that culminated with yet another Missouri title — and along the way, she averaged 22.8 points, 13.0 rebounds and 7.2 assists per game. McLean averaged a double-double — 18.3 and 12.9 — while shooting 51.5 percent for No. 16 Roland Park. Though the Texas Association of Private and Parochial Schools doesn't get as much publicity as the public school side, Rogers' averages of 25.0 points, 5.5 rebounds, 4.2 assists and 2.7 steals per game came against some quality opposition. And don't overlook the 82 percent from the line, the 3.3:1 assist/turnover ratio and oh yes, the 6A TAPPS state title. 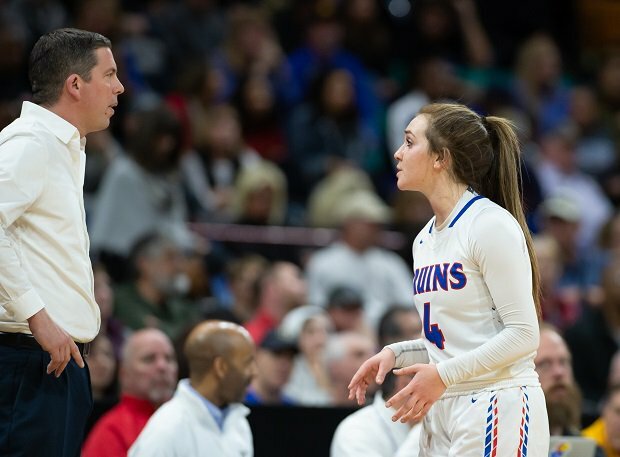 Cherry Creek surprised a lot of folks with that Colorado 5A title, but Van Gytenbeek's exceptional season did not. The 18.3 points and 5.1 assists per game were right in line what people expected. Winning the Texas University Interscholastic League 6A championship is a major accomplishment, but Carter put her stamp on it by scoring four straight points in the final minutes to take her team from down 45-44 to ahead for good in a 49-46 win. Cooke is yet another South Carolina signee on this year, which is why the Gamecocks' recruiting class was rated best in the country. She'll bring her 22.7 ppg and McDonald's All-American gear to the Palmetto State this fall. DeJesus, like Sierra Canyon, was a California surprise this year, and the junior saved her best for the big games. She made 58 percent of her 3-pointers in postseason, and averaged 17.5 ppg in those 10 games to lead Sierra Canyon to the Open Division championship and a No. 13 ranking in the Top 25. 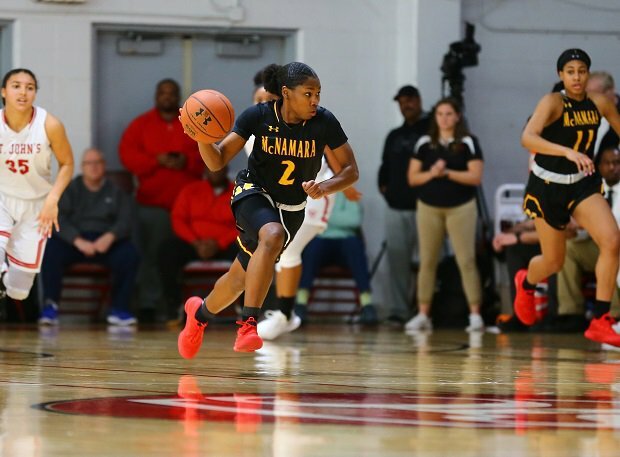 Matharu was the best of the horde of very talented Bishop McNamara players — and on a less-talented roster, she would have gotten more than 17.7 ppg. Pili's combination of strength and skill helped her to amass some impressive statistics — for example, 28.3 points, 16.6 rebounds, 3.1 assists and 2.4 steals per game. Hemingway's contributions — 22.4 ppg, 7.6 rpg and 3.0 spg — were a big reason why Houston finished the season 31-3. Despite Miami Country Day's high ranking (after spending most of the season No. 1, MCD finished fourth), it was much more a team effort than a setting for a superstar. Still, Love and her 17.9 ppg and 11.3 rpg stood out enough to earn this honor. Peters Township stayed beneath the radar despite a gaudy 30-0 record and the Pennsylvania 6A title, but Marisa's 20.8 ppg, 6.1 rpg, 4.3 apg, 2.6 spg and 42 percent shooting from beyond the arc did not go unnoticed. People may have the opportunity to step right at Notre Dame, which lost all five starters, and after leading Schlarman to a 33-2 record and an Illinois1A title, she understands success. Young averaged 24.3 ppg during the regular season but upped that mark to 30 in postseason to lead Valley to its second 5A title in three years. Alvarez capped a varsity career that began in eighth grade with a brilliant senior season for No. 4 MCD. Her falling-down 3-pointer to beat No. 1 New Hope at the Nike TOC might well be the shot of the season — but that should have come as no surprise, as she made 48.5 percent of her shots from beyond the arc. One would expect a 6-6 girl to average 11.8 rebounds, 17.2 points and 4.0 blocks a game — but we're betting you didn't expect 39 percent from 3-point distance. Brown-Turner was part of the Bishop McNamara army of talent, and averaged 16.2 points and 6.0 rebounds a game. Deans was the trigger for a very talented and undefeated Westridge Academy team, averaging 7.5 assists a game to go along with 3.6 steals and 10.9 points. Arkansas usually produces plenty of talent, and Goforth emerged as the best this season. She averaged 16.8 points, 5.2 rebounds and 1.3 blocks per game. Remember this name – the sophomore put up amazing numbers (29.7 ppg, 6.6 rpg, 6.8 apg, 5.3 spg) for 24-2 Braden River. Green's statistics —14.8 ppg, 7.0 rpg, 91 percent free throw percentage — might not jump off the page, she accumulated them while playing a difficult schedule in the world of Texas 6A basketball, where nothing comes easy. Neumann-Goretti played a host of good teams, and despite being 5-5, Johnson still managed 25.8 points. 5.7 rebounds and 4.6 assists per game. Westlake won the Georgia AAAAAAA title and finished unbeaten and No. 22 in the Top 25, thanks in great part to Johnson's 27.2 points, 9.0 rebounds, 3.4 assists and 3.5 steals per game. Louisiana doesn't get much of the girls' basketball spotlight, but Mingo-Young led Loranger to the 3A championship by scoring 22.3 ppg, grabbing 8.3 rpg, handing out 5.2 apg and even at 5-7, blocking 2.7 shots per game. Osborne led Windward deep into California's brutal postseason again, and showed off her elite skills against a very tough schedule. Owusu battled injuries all season, and though still a top-shelf player, it's hard to make one of the top six teams when you miss significant time. Rickards stood out from the host of elite talents on New York champ Christ the King, shooting 64 percent from the field and converting 81 percent of her free throws. Rivers averaged 24.8 points, 12.4 rebounds, 4.1 assists and 4.5 steals for 28-2 Laney, and the combination of team and individual success is hard to ignore. Ryle was Kentucky's best team, and Scherr its best player, winning the MVP award for the Sweet 16 playoffs. She "only" scored 15.1 points per game, but added 7.2 rpg, 4.3 apg, 3.4 spg and 1.5 bpg. Sidor led Saddle River Day to the New Jersey TOC finals, and even though she scored 27 points in the championship game, her team still fell short. Taylor has always been known for her superb defense, but she also averaged 16.3 points, 8.3 rebounds, 5.9 assists and 4.0 steals a game against a very tough slate of opponents. Yes, there is a connection — Malu is Dikembe's niece — and it showed in not only her 9.8 rebounds per game, but also her ability to protect the rim. On Centennial's balanced powerhouse, Walker was an outstanding defender and averaged a double-double. Warnock scored (29.7 ppg), was a threat from the perimeter (39 percent from three) and was a force in the paint (12.5 rpg and 2.0 bpg). And her team went 24-3.